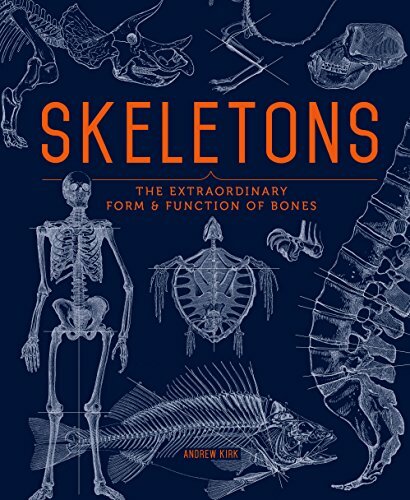 Skeletons is an illustrated guide that explores the form and function of bones and anatomy structures of animals. It talks about how bones function and plays a part in life, and explains why bones look and grow into the way they are. It would talk about different parts of the human body, and refer to the respective parts in other animals. There's explanation on the differences, like why certain animals have bigger jaws, or why animals have different shapes for feet, and how anatomy aids in walking. The book also discusses evolution, using dinosaurs for example, and there are also sections on gravity and domestication and how they affected evolution. There are lots of animals featured. Each animal have the interesting anatomy parts highlighted. The illustrations are beautiful pen and ink line art. Each animal only has one illustration though, so there are no orthographic drawings. This is an information and insightful reference book. It can be helpful for concept artists when designing their own creatures. For example, Terryl Whitlatch would often have drawings of anatomy structures alongside the creatures she designs. The book's a 256-page hardcover that's about A5 size.